What better way for a couple to remember their wedding than a personalized wedding ornament they can hang on their tree for years to come. 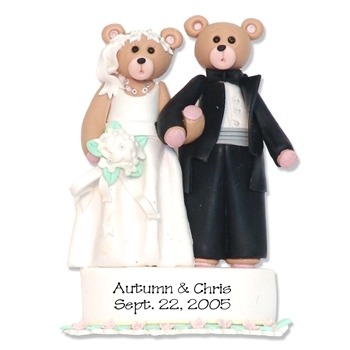 From Deb & Co.'s Wedding Collection this ornament is handmade from polymer clay. It is extremely detailed. The trim on the dress is beaded along with her veil. The bride and groom are attached to the cake. What a wonderful way to remember your wedding every year as you hang it on your Christmas tree! Eachand every ornament is designed by Debi Allison and all of our personalizedornaments are exquisitely handcrafted and detailed from polymer clay.Absolutely no molds are used!It comes complete with hooks and satin ribbon for hanging.